Modulars are very popular on LEGO Ideas and, in reviewing ideas projects I occasionally get emails asking why I didn't showcase one modular or another...the specific details vary but it is almost always because the presented modular lacked the touch of flair and attention to detail that makes the official LEGO line so popular with even the most casual FOLs. Some will press on with "well, how do I make it better?" Historically my response to this question has been "Make a build like the official modulars but redesign it to highlight your subject matter." Useless advice right, but what else can I say? 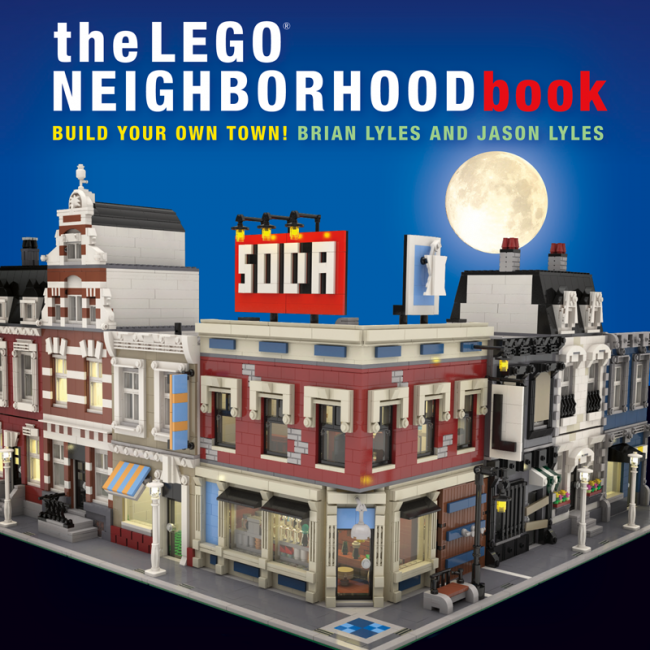 Well, now I have a new answer: Get The LEGO Neighborhood Book by Brian and Jason Lyles. I was not quite certain what I would find in this book, but I have admired the Lyles brothers' Chili's Restaurant in person so I was expecting to be impressed and that I was. The majority of the book, about 60%, is dedicated to instructions for a Drugstore and three modular houses in various styles. 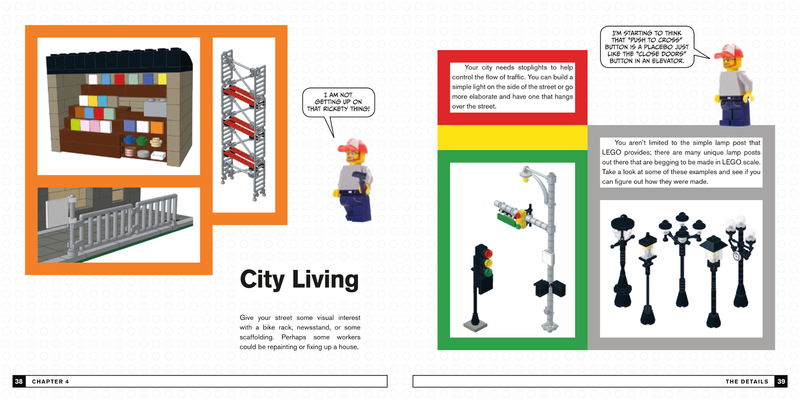 The rest of the book contains advise, mostly in a lead by example format, on how to design your own modulars. The Drugstore is a two story corner modular. The first floor is a drug store with a bar and big windows. It has a back room with gated access for delivery vehicles. The second floor is reminiscent of red bricks with a fully equipped apartment on the second. There is no roof access with this modular but there is a nice billboard and some air conditioning equipment. The shop has a loading dock with large double doors. A great touch that is unique to this build. The second floor apartment manages to contain a bedroom, full bathroom, kitchen, and living room on a single floor. A pretty impressive feat given the limited floor plan. The book also briefly showcases alternate signage and shop floor for creating a hardware store instead of the drugstore. The last 30% of the book is dedicated to three houses: a Parisian, a Colonial, and a Canal Ring. Now the real beauty of these design, a real stroke of brilliance, is that these three houses are all snot-on facades snapped onto a functional base model. The basic model is designed on a 16 x 32 plate with the traditional 8 studs for the side walk and 8 studs in the back for a yard. The structure has a door to the front and the back, and four windows on each floor and a pair of attic windows. The critical factor however is that the structure has an array of forward facing studs on the top and bottom of each story as well as around each window. The book then shows how to create a snotted Parisian, Colonial, and Canal Ring facade to snap onto these studs. This is a really inspired way to explore a variety of Modular styles without breaking the bank or burning time creating brand new structures from the baseplate up. Now these base builds don't take into account the internal framework, there are not even stairs to get from one to story to another, but they serve their purpose of fleshing out an entire city extremely well while letting you concentrate on the aesthetic qualities. In my opinion this concept of facade modulars pays for the book, especially for any FOL or LUG looking to build big on a budget. 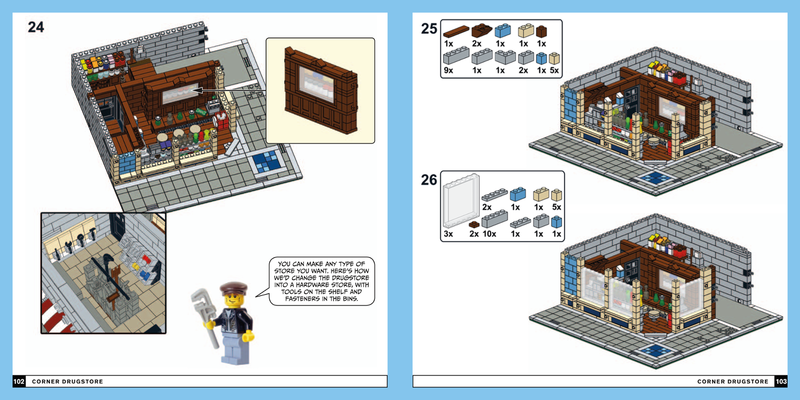 Although there are a few more instructions sets for minor items, the rest of the book is mostly about designing your own modulars. In many ways it reminds me of those DIY home design and repair books as it showcases several options and discusses the thought process behind those choices. In other ways it reminds me of a department store catalog (ah! a bygone era), as it is filled with multiple incarnations of various appliances, furniture, and home decor to choose from. 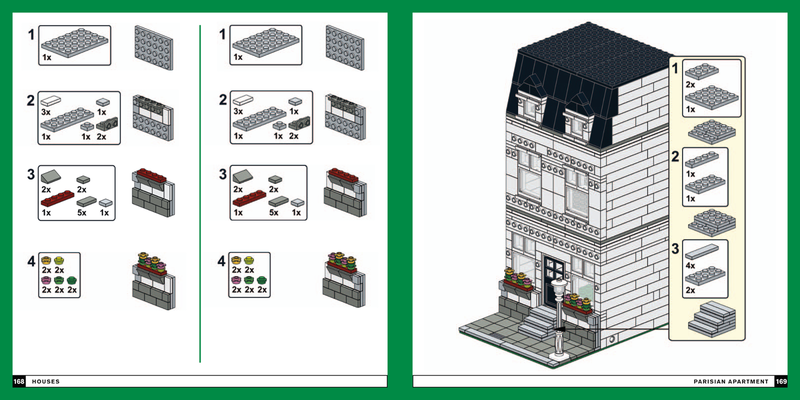 This covers the details that make a modular a modular: the interconnects, the baseplate, the sidewalk, the stacking, etc...This is probably not news for anyone who would be getting the book for themselves, but is fundamental to setting up the book. This chapter discusses the use of color and symmetry in creating an attractive modular. This chapter discusses the practice of observing real world architectural elements as specific brick elements. This is a fundamental skill for LEGO crafters. In this book, the Lyles brothers use a variety of photos of real world architectural elements paired with very similar LEGO elements to emphasize the practice. This chapter displays a variety of ways to orchestrate external details of a modular. For instance, there are 16 variations on windows with shutters. For the most part these builds do not come with instructions but they are displayed in such a way that most knowledgeable LEGO fans should be able to reverse engineers the builds. There is one notable instruction set in the chapter for a very detailed traffic light. The Interior is, as one would expect, similar to The Details in format but applies to the furniture and appliances that occupy the Modular. There are, for example, 20 seats ranging from bar stools to recliners, 7 beds, and 12 night stands. This chapter is pretty much the most straight forward showcasing 21 very creative and well implemented modulars and four mini-modulars. This is a great book for the moderately adept through accomplished Modular Builders. The less experienced will get some great tips on how to liven up their builds and the grand array of example decor and architectural elements should please even the most veteran FOLs. Less experienced LEGO builders might have some difficulty, at first, reverse engineering the content that does not have explicit instructions but as long as the don't give up on it, it will actually turn into a great training exercise. As far as brick budgets go I really love the ideas of the base model with facade introduced in this book. Since the sides of most modulars are covered up by, well other modulars, and the facade totally covers the front facing support structure, you can implement the base model with whatever brick is handy. This leaves you a lot more wiggle room, both in part count and price, to work on core designs and giving variety to the modular neighborhood. The concepts, advice, and examples in this book can really help with not only modulars but also with any build where you are looking to breath more life into your displays.